I live to eat. Seriously. Food is my favourite thing. Well, good food that is. Eating good food brings me the greatest joy; not simply because of the flavour combinations and creations that chefs dream up and inspire, but because of the connected nature of food to social happiness. Food is nothing if not meant to be savoured and shared with the people who should bring you as much pleasure as the little bites of goodness that make eating such a scrumptious ordeal. There is a huge difference between eating and dining. I don’t mean dining as in silver service and six courses of tiny little morsels that you can barely understand because one bite and they’re gone. I mean a dining experience. An occasion that incorporates phenomenal flavours, textures and aromas with great music, an atmosphere you struggle to encapsulate in words and of course, the company. One of my favourite things in life is that moment when you sit back and realize that a bunch of isolated elements have culminated in one magnificent feeling. That is the power of good food. It brings people together just like the marrying of flavours and unexpected tastes in a single delicious dish. Anyone who knows me knows I love eating out (even when I don’t have money for petrol or shampoo) – it isn’t just because the food is better than whatever I could come up with at home and I don’t have to do the dishes, but because food is social and the catalyst for conversations and connections. It is a way to indulge in someone else’s experience, immerse yourself in a culture or simply share a special moment with the people you love. Especially in this crazy busy world, going out for a meal (or even just sitting down at the dinner table with your family) can pause that fast-paced frenetic frenzy we call life and let you revel in something a little less chaotic. So it fills my heart whenever I go somewhere new and find myself speechless at how insanely wonderful the dining experience is. And luckily for me, I live in a city where creativity flows and good food is in abundance. But every now and then you stumble across an unexpected brilliance and forget where you are in the world because there is an energy there that exudes specificity and, quite simply, takes your breath away. Such was the case last night. 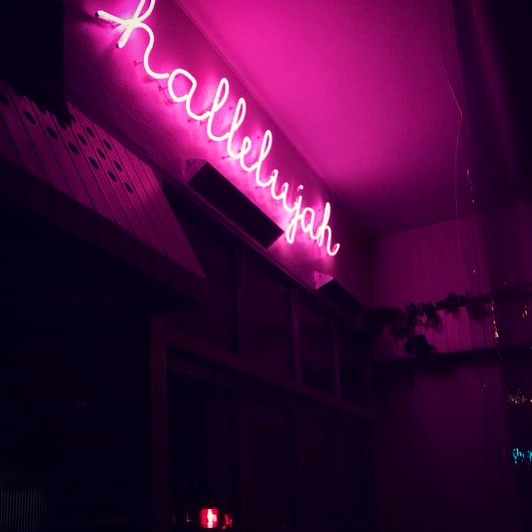 After a day filled with spontaneous adventures and explorations, Nika and I accidentally (literally) came across what is now our favourite place in Cape Town: Hallelujah on Kloof Nek (nestled between Kyoto and The Power and The Glory). This little treasure is almost completely inconspicuous, except for the neon pink wiring at the entrance that welcomes you into this slice of culinary heaven. Hallelujah is small and intimate but in a way that you don’t feel on top of the people sitting next to you. The kitchen is the size of a postage stamp but holyyyyyyyyy hell does it churn out some of the best food I have EVER eaten in my whole entire life. The owners – one is the chef and the other is the waitress/bar lady – are both young locals who are well-traveled and decided to open a restaurant in Cape Town that had pieces of some of their favourite places around the world. As soon as we walked in I felt like I was in Amsterdam, Nika felt like she was in San Francisco and we were both sitting at a little bar counter surrounded by the pink lighting that jumps across Kloof Nek and looks onto Cape Town. The food is meant to be shared – the way food should be eaten in my opinion – but dishes are exactly the right size so that you get to really taste all of the ingredients and culinary processes that went into this perfectly portioned Asian cuisine without being overwhelmed by one flavour or another. Niks and I had four dishes between us and were so content at the end of our meal we wanted to move in. First up the special – noodly soup. Ok, can we have a moment here for how f***ing incredible this was. I am not even going to try and describe this one because nothing will do it justice but if I could I would swim in this soup. 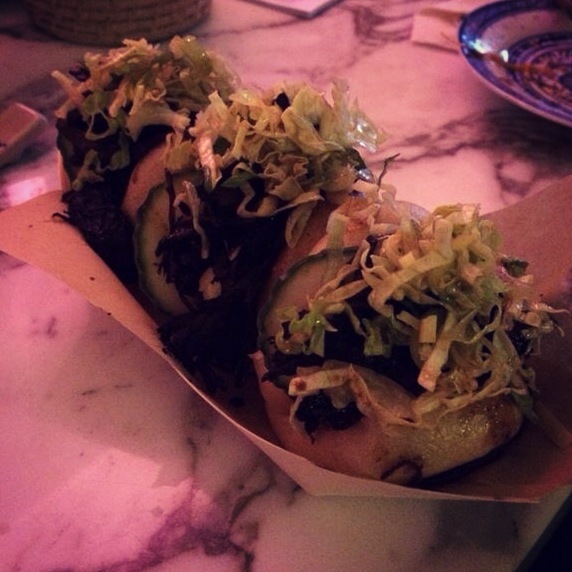 Then we shared grilled prawns on steamed buns (my new favourite thing), followed by pulled beef with asian slaw on those same steamed buns I now dream about. This was a genuine highlight for me because whenever I watch The Food Network (and in particular Diners, Drive-ins and Dives) they have pulled pork what-whats and they always look AH-MAZING but because I don’t eat pork I always feel cheated (story of my life when it comes to breakfast, but that’s a story for another day). Plus, I always avoid ribs due to fear (any meat on the bone gives me the creeps) so this dish combined two things I would never normally be able to eat into the most wonderful burst of full-flavoured deliciousness. 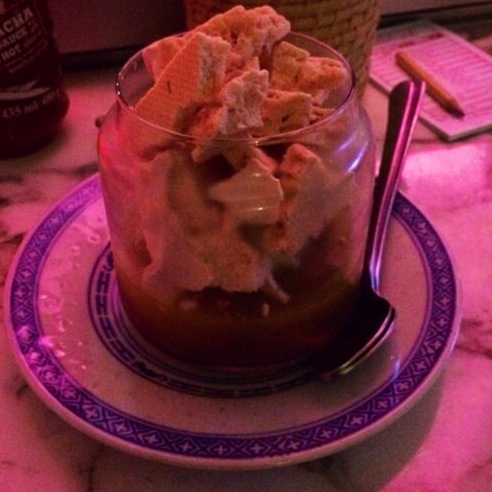 And then dessert – a Consol jar of pure indulgent heaven. I actually cannot even. Totally obsessed with the owners, their Ziggy Marley-based playlist and dance moves behind the counter. It is very seldom you find a place that has everything: unbelievably amazing food and drinks, great music, enticing owners/staff and guests that are super cool without being pretentious try-hards. If I could go back everyday I would, I am just slightly too poor for such magic. Hallelujah is not exorbitant but it is a little pricier than your average restaurant, but that’s because it isn’t your average restaurant. AT ALL. I am always happy to pay more for food that blows your mind in a place that steals your heart. The menu is small but balanced and extremely well-executed; with 2 Seafood dishes, 4 Meat dishes (including duck which is my FAVVVVVE but rarely seen on local offerings), 2 Vegetable dishes, a seriously to-die-for Dessert and a specialty dish which last night happened to be that beefy broth noodle soup that cannot even be described but must be eaten by every human being on this earth. 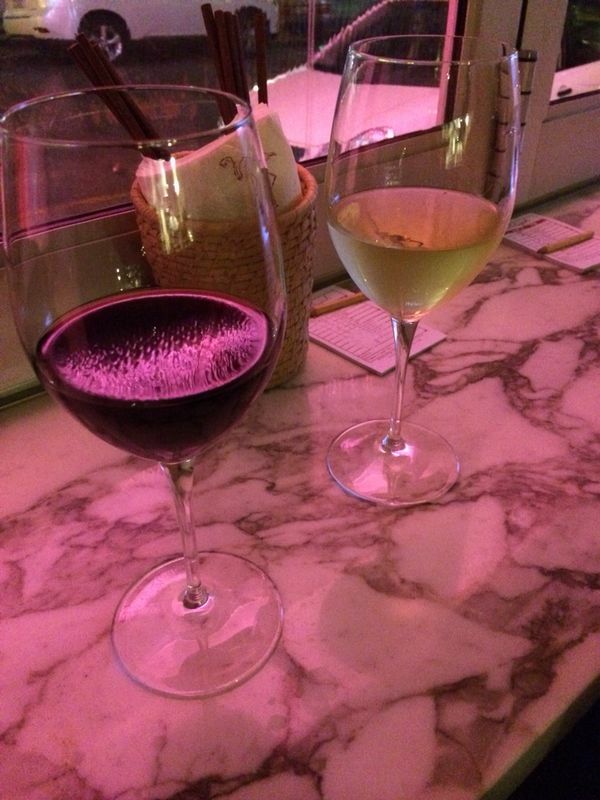 They also have a great selection of beers, wines and cocktails and a wall completely covered with flamingos. WHAT’S NOT TO LOVE? 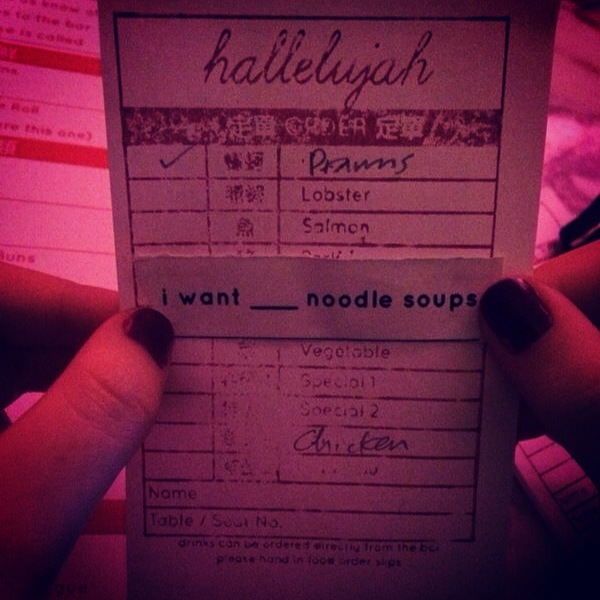 So here is what we ate at Hallelujah aka Heaven while listening to some seriously funky beats and falling in love with the entire atmosphere (and the owners). For more information check out Hallelujah’s website here. beefy noodle broth with sliced pork (uneaten but I am sure deeeeelish), pak choi and boiled egg. DYING. Nika almost ordered this again straight away. 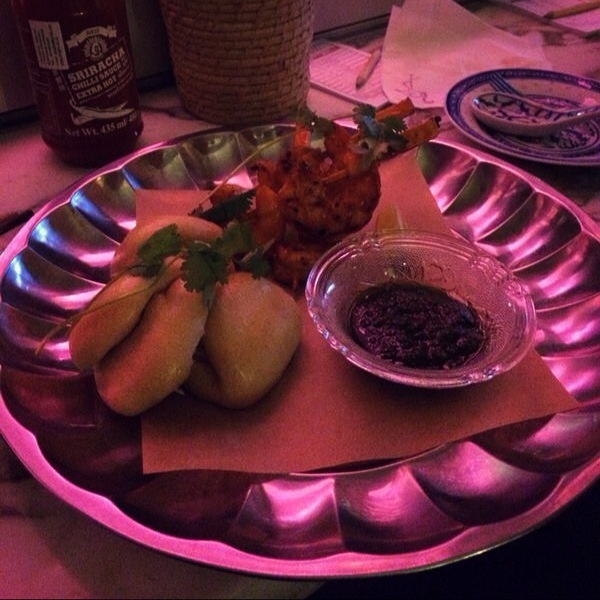 grilled prawns on steamed buns (I could eat a dozen at once) with coriander and lime sauce. MY GOODNESS ME. 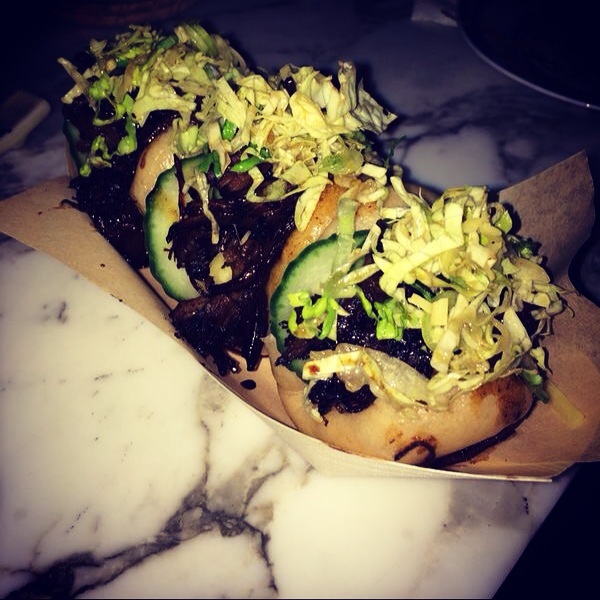 pulled beef short rib on steamed buns with cucumber and rich beef sauce. this dish needed a flash. After finishing (devouring) these three UN.BEE.LEE.VABLE dishes Nika and I were both sufficiently satisfied and totally full, but the adorable owner/waitress/girl crush asked if we wanted dessert and only because she said it was good we said yes. Shame, so impressionable. dark vairhona chocolate mousse with passion fruit jelly, coconut ice cream and rose water meringue. STOP IT. Hallelujah creates art. 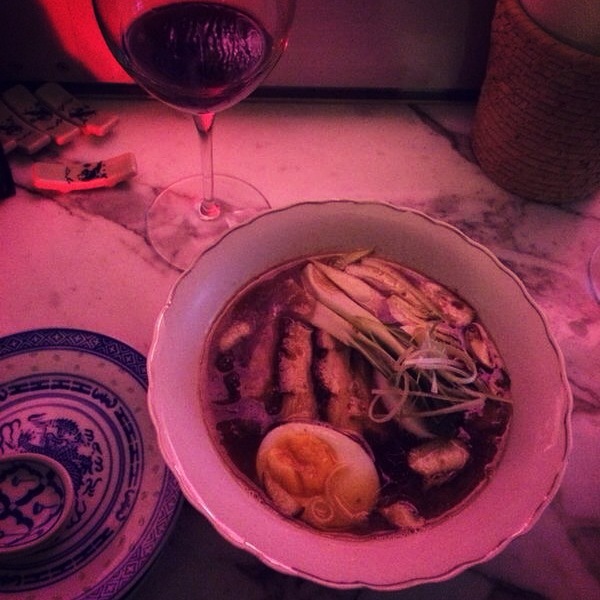 Not just in their dishes which are RIDICULOUSLY GOOD but in the whole vibe. It is a Cape Town gem and I highly recommend everyone and their mother go there. If you’re still a student or on a minimum wage salary like me; save up for this because you WILL want to try everything and it will set you back a bit (our total bill came to R410 but was worth every single cent). I do believe I am in love.